Table View: display images in a total line? I did a Table view and inserted a total line. One column is displaying images and I would like to show the image on the total line (just like in the columns). Would it be possible to do that ? 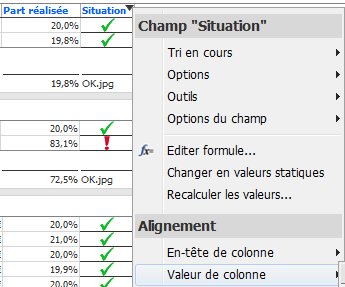 Images are supported in the table cells, but not in the Total row, that is performing mathematical functions on the values. And how can we hide the name of the image ? 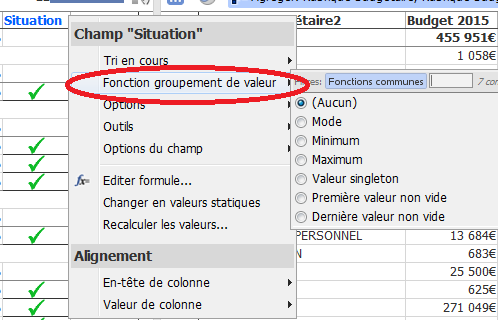 You have to apply grouping or aggregation in the table view for the options to appear. Thanks Daniel, my data are aggregated but not grouped. If I say "none" in the aggregated data, I loose the whole column. You are using Aggregation with 'Show overal summary row' option from the Grouping menu. Once you've ticked the summary row option, on the right-click on the field header you will be able to select 'none', under the Grouping value function. I've unticked this option for the last field, and it didn't disappear. You can give us a call to do a screen-share. OK, I can do it, but only if my data are grouped. And I do not want to group because it adds summary lines I do not need. It could not work because I selected 'Calculate formula field results for group result values' in the Table View toolbar > Tools > Formulas menu (thanks Richard for this information). But it is now corrected in last 2.9 Plus.